The awesome burden of lineage sits heavily on young shoulders however there are some for whom it is a sacred responsibility to carry on and even enhance their inheritance. It is young musicians such as these who have propagated and enriched our music through the millennia and are responsible for its continuum. These are the gharandedar musicians who are poised and equipped to create history in the new millennium. Shounak Abhisheki is the son and disciple of Pt. Jitendra Abhisheki one of the foremost proponents of the Agra gharana. Smt Kamaltai Tambe of the Jaipur gharana initiated the young Shounak into music. Thereafter he underwent continuous and rigorous training under his father and imbibed his versatility and commendable talent. Shounak is thus equally adept at various genres such as Khayal thumri, tappa, bhajans and the delightful and unique marathi natyasangeet. Gifted with a voice that is strong sweet and power packed backed by intensive tutelage Shounak is set to take the music world by storm. This pleasing evening melody is pentatonic in its ascent. It omits the rishabh and dhaivat and has the komal form of nishad. The unusual descent uses both rishabh and dhaivat and drops the komal nishad. Shounak introduces the raga via a brief alap in nome tome a characteristic of the agra gharana. He introduces each note one by one the first appearance of the gandhar is noteworthy. The start of the bandish is just short of the sam or first beat of the tala cycle. The superb composition by Pt. Ramashray Jha in the slow 12 beat ektala highlights each nuance of the raga laying bare its beauty. Shounak embellishes this further through extensive and detailed variations of both sthayi and antara. At a faster tempo he rounds off in prescribed manner with beautifully thought out sargams boltaans in tala and tans. This exquisite composition by Pt. Ramashray Jha is the follow on to the slow khayal. Shounak dwells on the first line embroidering it skillfully and delicately to showcase its inherent charm. The young singer displays remarkable maturity in the manner in which he lays equal emphasis on both shabda and swara. There is an undercurrent of entreaty a heart stirring request to the almighty through the text. The complex sargams and well sculpted tans in conclusion are backed by excellent tabla support. Triveni is a compound of three ragas such that they emerge as a single identity. However the constituent ragas peep out of the amalgam and can be recognized individually. This concept is not new earlier this was known as tirbaan. Each raga comprising a trivent is one sung at that particular time. Thus there are trivents of the morning evening and night. This particular triveni is a heady blend of ragas Jayat Puriya and Puriya dhanashri all early evening ragas. This traditional and ancient bandish is an ode to goddess Saraswati. It is stately majestic and awe inspiring and moves with regal grandeur and measured tread through the sthayi and antara. Shounak’s balance is particularly visible in this piece as he reins in his youthful exuberance and keeps to the devotional mood it evokes. Well worked out boltaans according to the tala syllables emphasize this well knit bandish. Of particular interest is an amazing array of seamless tans which maintain the unique identity of the conjoint raga and yet allow each of them to be recognized. One of the most difficult ragas of Hindustani music Raga shree has a poignancy that tugs at the heart strings. This twilight raga is easily identified by the unique linkage of the komal rishabh to the pancham. Shounak commences the tarana at a brisk pace which he maintains throughout. The tarana is a medium for display of versatility and command of raga and tala as text is replaced by meaningless syllables. Shounak does this with a mastery that belies his years keeping the movement of the raga at center point and playing effortlessly with the 12 beat rhythm cycle. This perennial favourite is a parent raga of the Khamaj thaat which groups together all ragas utilizing both forms of the nishad. Melodious soothing serene this raga is at its best when used for expressive genres lends itself to infinite variations to portray different emotions. This often calls for notes outside the raga to be touched upon and the mishra prefix is then added on. In this dadra composed by his guru Pt. 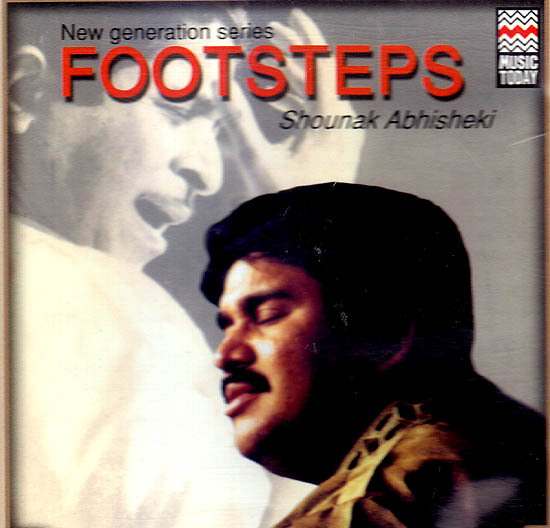 Jitendra Abhisheki Shounak Demonstrates his laudable grasp over the emotive genres of music.